I decided to blog today because I was feeling happy. So I thought why not spread the happiness? Lately, I’ve not been feeling as happy as I used to. 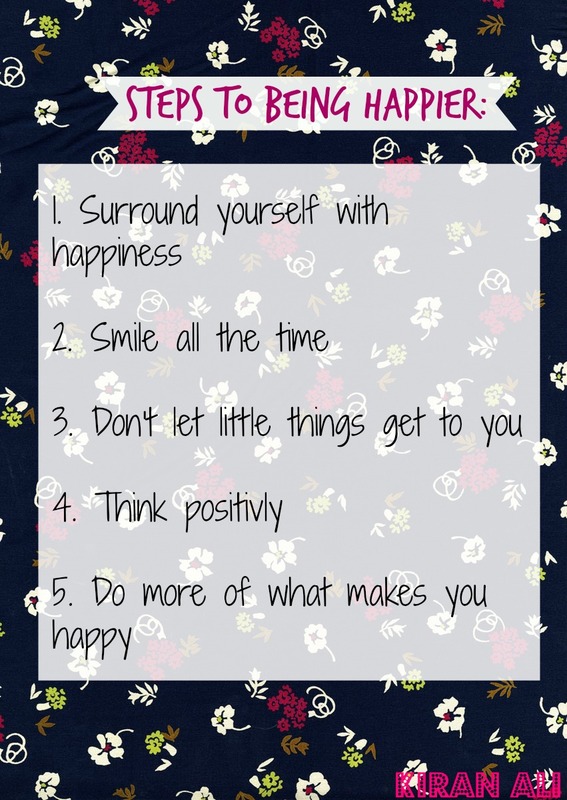 So I thought I need to be happier and came up with five steps to becoming much happier. They truly do work. 1. If something upsets you change it so it makes you happy or doesn’t bother you at all because if it doesn’t bother you you’ll be happier. Surround yourself with friends who make you happy and care about you. 2. Always smile. Anyone who walks past it brighten ups their day if you get a smile back it’ll brighten yours too! Spread the happiness. 3. Don’t let the smallest things get to you. I over-think the smallest things so much, I’ve recently stopped it changes how you think so much. 4. Always think positively it changes your mindset and how and when you do things, giving you a positive outlook on the days ahead. 5. If you are doing something that upsets you stop doing it. I think one of the most important things in life is doing things that you want and doing things that make you happy. I’m thinking of doing a group of these posts if you’d like to see more drop it in the comments I’ll be sure to do more of them. Fabulous! Part of my mission is uplifting others, thank you!